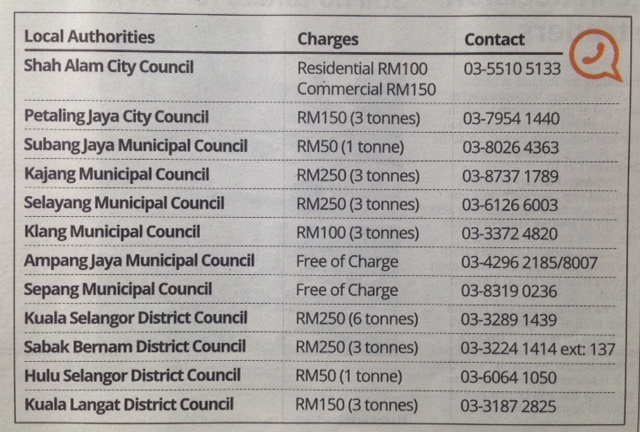 When it comes to settling their debts, Malaysians are certainly a recalcitrant lot. It has become the norm to read about the number of Malaysians who refuse to repay their loans or arrears. There are also those who simply ignore traffic summonses. Defaulters are getting increasingly bold because they know they can get away with it. The government has come up with one solution after another to recover the money, but so far it has met with limited success. The defaulters know if they wait it out long enough, the government will offer them incentives to clear their IOUs or just write off the amount owing as bad debt. These ugly Malaysians are giving the country a bad name. They are also encouraging those who want to settle their government loans to think twice about doing so. After all, why bother when so many others don't bother? Why be a fool when the smart ones just shrug off all reminders about their outstanding loans? Errant tenants living in government low-cost flats owe Kuala Lumpur City Hall (KLCH) more than RM82m of which RM25m has to be written off as bad debt. KLCH rents out a total of 52,851 low-cost units. 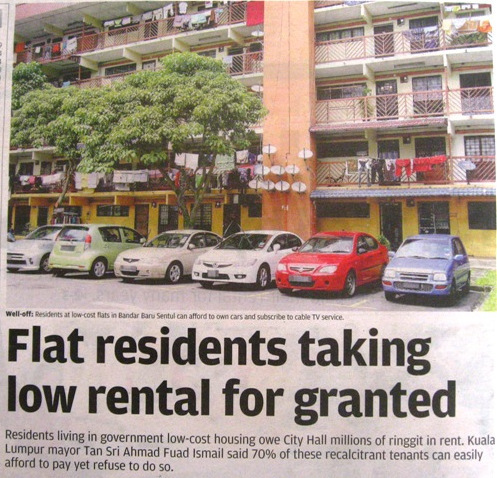 More than half (36,995) of the tenants have rental arrears, even though rentals which range from RM90 to RM124 a month are among the lowest in the world. Judging from the number of Astro satellite dishes, air-conditioners and cars outside these flats, it is clear that it is not a question of inability to pay, but rather of refusal to pay. It's the same with paying maintenance fees. 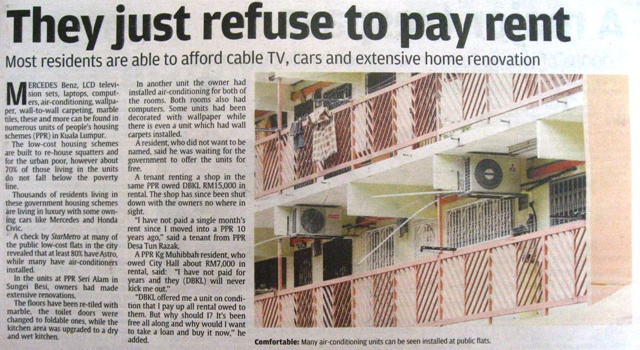 In my housing area, more than half the owners refuse to pay the monthly charges. Some have not paid for several years. 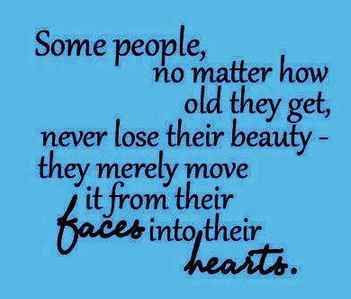 Their reason? 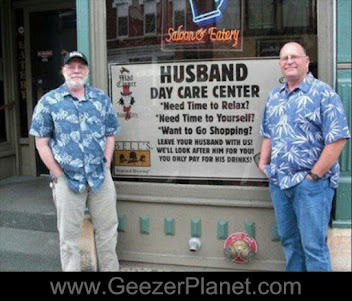 They are not satisfied with the management services. But if they don't pay, where's the money for maintenance coming from to upkeep the facilities? It's also unfair to those owners in good standing. The management tells me they are at a loss about what action they can legally take. They have no authority to cut the water or electricity supply to these units. The only legal recourse kicks in when these owners find that they are unable to sell their units should they decide to move out. But as long as they intend to live there for life, why should they care if they owe thousands in maintenance fees, or rental arrears for that matter? ﻿As for educational loan defaultors, never mind that they are depleting the pool of funds available, and depriving deserving students in need of financial aid. According to the National Higher Education Fund Corporation (PTPTN), 228,000 loan recipients have yet to repay a total of Rm2.5 BILLION. The numbers numb the mind. Many of these defaulters have long graduated and are earning a good salary. But the thought of repaying their loans is far from their mind, and low on their list of priorities. They would rather spend the money on home renovations or a family holiday abroad. 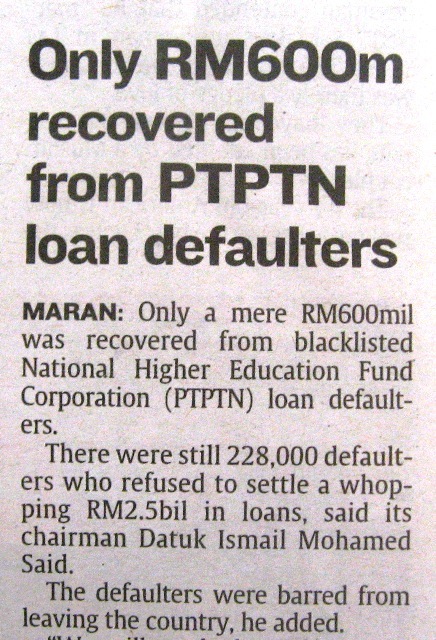 ﻿The government regularly publishes in the local papers the names of these study loan defaulters, in particular, those who took MARA study loans. The ignominy has little effect on these thick-skinned, bare-faced defaulters. 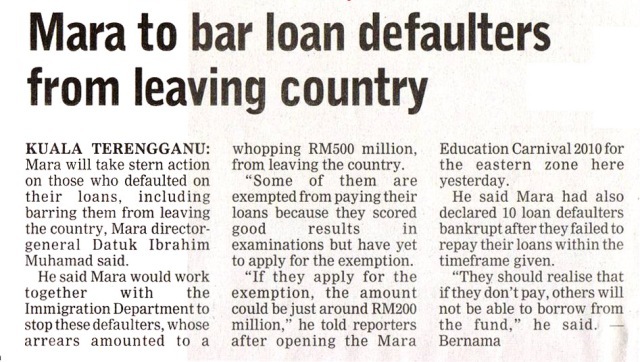 It's the same story for the more than 64,000 school leavers who owe the government Rm520m in skills development loan arrears. These numbers reveal the blatant disregard of their obligation to repay the loans. Imagine what this sum of money could provide for the poor and needy. Non-payment of debts and late payment of bills is so rampant that some government departments have resorted to desperate and novel measures like offering various incentives to these underserving and irresponsible citizens. The Water Department of Negeri Sembilan (Syarikat Air Negeri Sembilan) recently offered an array of prizes totalling more than Rm100,000 to consumers who settle their electricity bills promptly within 30 days. 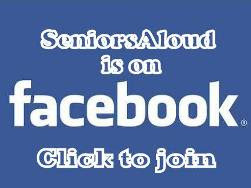 These prizes include a car, laptops, LCD TV sets, digital cameras and MP3 players. Imagine how responsible citizens must have felt. They paid their traffic summonses on time and in full, but it's the irresponsible traffic offenders who not only escaped a fine or a blacklist, but got a 50% discount! Offering incentives is not the solution. It will only encourage Malaysians to expect rewards for doing something that they should have done in the first place. It is giving the wrong message to others, especially the young. The government should pull up their socks and be firm about eradicating this bad practice before it becomes ingrained in our culture. Do what the private sector does. For example, the banks do not hesitate to sue loan defaulters, repossess their car or auction off their house if they fail to meet the monthly loan repayments. The government should know by now that soft arm tactics don't work. Why is the government so reluctant to mete out harsher penalties? Why is it hesitant to act more firmly to recover the hundreds of millions owed by these recalcitrant Malaysians? Only the government can answer these questions. Meanwhile the public coffers continue to bleed, and bleed. JUST PACK YOUR BAGS AND GO!